Special Containment Procedures: SCP-2292 is to be kept within a medium animal containment cell large artificial containment enclosure at Sector 21-A of Biological Containment Site-66. The containment enclosure must resemble the mountain rainforest environments of Central Africa and include trees, a stream, temperature control, artificial wind, and audio broadcasts of realistic environmental sounds as per recent Ethics Committee guidelines. SCP-2292 does not require sustenance but may be provided with fruit for cooperative behavior. As SCP-2292 is immune to tranquilizers, tissue samples are to be retrieved during each weekly enclosure inspection and cleanup. SCP-2292 must never be in close proximity to within visual range of within 80 m of a deceased animal. SCP-2292-2 are to be terminated via incineration and disposed of per hazardous waste protocol. Description: SCP-2292 is an anomalous instance of mountain gorilla (Gorilla beringei beringei) with the ability to reanimate animal remains and spread a fatal illness by touch1. SCP-2292 is biologically alive despite its lack of a heart, which has been replaced by a tuberous root-like structure. This apparatus has been classified as SCP-2292-1 and is presently hypothesized to be the source of SCP-2292's anomalous nature. SCP-2292-1 radiates with an amber glow and pumps a similarly colored substance throughout SCP-2292's body, which appears to have replaced its blood. Organisms reanimated by SCP-2292 have been classified as SCP-2292-2. SCP-2292-2 instances are not returned to biological life (decay continuing at a natural rate) and will not cease animation unless rendered completely immobile, either through total destruction or the deconstruction and separation of the entire muscular/skeletal system. Direct study of SCP-2292's unusual biology, including its surrogate "heart", has been rendered difficult due to its immunity to tranquilizers, natural strength, and anomalous capabilities. Previously employed methods of study, such as vivisection, are no longer considered appropriate as per current Ethics Committee guidelines. Maintaining the cooperation of SCP-2292 is presently considered more important, as further physical analysis could potentially result in its neutralization. SCP-2292's behavior is within the expected range for a male of its species, save for certain deviations presently attributed to chronic isolation. Due to its non-human psychology, it has proven difficult to properly measure SCP-2292's level of cognition but it has displayed a cunning intellect, with SCP-2292 breaching containment on numerous occasions. It remains unknown whether SCP-2292's intelligence is an aspect of its anomaly, a side-effect of its increased lifespan, or something else entirely. SCP-2292 was recovered during a 1966 raid on a London warehouse owned by subsidiaries of Marshal, Carter, and Dark Ltd., SCP-2292 already secured within a acrylic glass containment unit. Documents retrieved from the site reveal that SCP-2292 had been discarded at the location after having "exhausted its usefulness"; the meaning of this remains unknown. The documents state that SCP-2292 was initially captured during an 1898 expedition into an uninhabited region of the Congo Basin. A journal belonging to Harrison T. Winchester III was among the recovered documents. Winchester was an experienced explorer who, in 1898, left his home in Bradford, England without explanation and never returned - his unexplained disappearance the subject of frequent speculation. Hired by MC&D to be part of a secret expedition into the Congo Basin2, his journal details the capture of SCP-2292 and includes descriptions of the potentially anomalous location (now classified as SCP-2292-3) where SCP-2292 was initially discovered. Locating and properly containing SCP-2292-3 is of the utmost importance. Despite several expeditions and advances in satellite imaging, SCP-2292-3 continues to elude rediscovery. Addendum I: The Foundation's attempt to teach SCP-2292 language via keyboard lexigrams3 has had unexpected results. Non-anomalous great apes have been taught how to use and express themselves through such lexigrams and it was hypothesized that the Foundation would have similar results with SCP-2292. SCP-2292 destroyed the keyboard while being taught the symbol for "flower". Still within its enclosure, SCP-2292 proceeded to use damp soil to create a symbol on the wall of its enclosure which it then gestured to repeatedly. Creating a new experiment, an electronic visual display was installed within the enclosure - visible but outside of SCP-2292's reach. SCP-2292 was then provided with various non-toxic paints while an image was produced on the display, first focusing on flora and fauna native to SCP-2292's environment before eventually moving to abstract concepts. When SCP-2292 created a corresponding symbol, a piece of sweet fruit would be delivered to SCP-2292's enclosure. By 1976, after approximately 5 years of study, it was concluded that SCP-2292 not only understood language but had in some manner been trained for symbolic understanding and communication prior to its containment, effectively teaching researchers its own language (or rather, the language of whoever previously trained SCP-2292). During this time, SCP-2292 (referred to as "Inaki" by its handlers, as part of the behavioral analysis program) has shown a fondness for crafting primitive stone tools (including a functional spear), painting glyphs, and watching the television series Mr. Rogers' Neighborhood and Bob Ross' The Joy of Painting. SCP-2292 communicates via a specialized keyboard which in turn produces an artificial voice. SCP-2292 is to be communicated with through the use of sign language and spoken English (preferably both in unison). A playful tone of voice has been shown to have a calming effect on SCP-2292. Foreword: Routine conversation with SCP-2292. Dr. Hayashi: Inaki. How do you feel today. Dr. Hayashi: But you just ate! SCP-2292: [shakes its head] Tired hungry.4. Frown, bad, cry, frown, sad. Dr. Hayashi: I am sorry Inaki. Why do you feel sad? Dr. Hayashi: Inaki is not alone. Inaki is loved by Sara. Inaki is loved by Joseph and Alex and Audrey. The bad ones are gone. No more hurt. SCP-2292: Inaki love Sara. Inaki sleep-see5 old home. Cut hole. Bad trouble think. Cut sharp-noise cry. Deep stone long dark. Love Blue-Flower6. Blue-Flower is hole. No more being. Sara [will be] hole. Inaki [will still] be. No more being. No more hurt. Dr. Hayashi: Inaki. Sara is not leaving you. Dr. Hayashi: No worry. No fear. Inaki is safe. Sara is safe. Understand? Dr. Hayashi: Alex said that you made new tools. Will you show Sara? Closing Statement: SCP-2292 is not only aware of death but its own (apparent) immortality. Based on its preexisting knowledge of symbolic language, it is possible that "Blue-Flower" may have been the one responsible for teaching SCP-2292 in the first place. And, potentially, the one responsible for its anomalous nature. I suspect the answers lie within SCP-2292-3. Foreword: An attempt to glean more information about "Blue-Flower" and SCP-2292-3. Dr. Hayashi: Inaki. Tell Sara about old times. About Blue-Flower. SCP-2292: Blue-Flower. Friend. Love Blue-Flower. Hole. Not here. Not here. Dr. Hayashi: Tell Sara more. Sara wants to know about Blue-Flower. SCP-2292: [SCP-2292 places a hand over SCP-2292-1] Blue-Flower. Made. Made. Made.7 Blue-Flower good [to] Inaki. Cry. Frown. Sad. Sad. Blue-Flower [is] hole. Want see. Want near. Dr. Hayashi: Inaki. What was Blue-Flower doing when you last saw them? SCP-2292: Not move. Hole. Hole. Made move. Not Blue-Flower. Move [but] not Blue-Flower. Sad cry. Frown. Hole. Sad. Frown. Dr. Hayashi: Did Inaki live with Blue-Flower? SCP-2292: Inaki special. Inaki first. Inaki one. One Inaki.8 Blue-Flower love. Warm. Made hole. Made heart. No hurt. No hurt. Miss. Frown. Tired hungry. No. [Do] not want. Dr. Hayashi: I'm sorry Inaki. You must miss him. Dr. Hayashi: Where did Inaki live? Does Inaki remember home? SCP-2292: Green. Trees. Water, water, water move. Stones. Stones on stones on stones. Large. Large. Inaki small. Songs. Feather song. Man song. Blue-Flower, smile greet. Many people. Faces. Cheer cheer smile wave. Inaki special. Love Inaki. Move move. Laugh smile. Dr. Hayashi: What happened to home? SCP-2292: Blue-Flower not move. Home not move. Home stop. Home stop. All stop. Not Inaki. Inaki never stop. Closing Statement: Based on my interpretation of what they communicated, I believe that SCP-2292 is the last of its civilization. Or rather, a tame animal that outlived those who first tamed it. 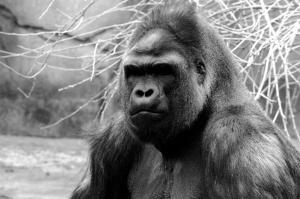 I suspect that trained gorillas were common to the SCP-2292-3 civilization. I presently hypothesize that SCP-2292 was raised for the purpose of being anomalously augmented but to understand SCP-2292, it is necessary that we understand the context of its creation; for that, the Foundation must find SCP-2292-3. 1. An exact causative agent for this has yet to be discovered. 3. A lexigram represents a word but is not necessarily indicative of the object referenced by the word with each lexigram having a corresponding key. 4. A combination used by SCP-2292 to express a feeling of sadness, feeling similar to an empty stomach mixed with fatigue. 5. It is currently believed that "sleep-see" refers to dreams/dreaming and/or memories in general. 6. SCP-2292's previous use of "Blue-Flower" suggests that it does not refer to an actual flower but instead denotes an individual and may even represent a personal pronoun. 7. SCP-2292 had recently learned the sign corresponding to "made/make" and was able to reproduce a corresponding symbol, then added to the lexigram. SCP-2292 has used the symbol to express concepts of creation and alteration. 8. SCP-2292 understands the difference between "first" and the numeral "one" but has been unable to express "last". It is speculated that SCP-2292 is expressing that it is the first and last of its kind; whatever that "kind" might be.